As you know, my blog is almost exclusively dedicated to women’s specific pre workouts and fat burners and diet pills. And protein powders and even protein bars. But every once in a while we have to go outside the box and try a product that might not exactly be made for women. The EVL ENGN is one such product. I’d actually go as far as to say that ENGN is probably a men’s specific product. With it’s mysterious black and blue packaging, aggressive layout, and telling name- this is most certainly a product made for, and targeting male athletes. But that hasn’t stopped me before, has it? Most certainly not. After all, I’ve reviewed all the ‘big-time’ men’s pre workouts out there. From Pre-Jym, to Assualt, to C4. And I’m sure there are others that I’m leaving out. But basically the only things that differentiates men’s and women’s pre workouts is the presence of creatine. Creatine will make you stronger, but also cause you to put on the infamous ‘water weight’, and give you that bloated appearance. Engine pre workout definitely has creatine in it, but I’ll talk more about the formula itself in a minute. First we will talk about the flavor, and if ENGN actually works. I had the pleasure of trying three flavors of ENGN as a product of buying a tub of the green apple for myself, and then sampling the blue raspberry, and also fruit punch options. So luckily for you, after this review you are going to have a good sense of all three flavors, and know which flavor of EVL ENGN Is the best. Blue Raspberry: Speaking of the best flavor of EVL ENGN- it’s 100% this one. The blue raspberry was the first flavor of ENGN that I tried, and it was the one that I liked far and away more than the other two. What’s odd about this blue raspberry flavor is that it really has a more tropical and citrusy taste than you would expect. It does NOT taste like the standard ‘blue snow cone’ that you get most of the time with a blue raspberry flavor. The taste sort of starts that way, but then you get some serious tartness and almost lemon flavors and the snow cone starts to fade into something even more delicious. I can’t really describe it any better than that- but just trust me this is the best flavor of ENGN. Fruit Punch: I don’t have a whole lot to say about this flavor because the sample pack was just two servings so I tried it just the one time (that’s right I beasted both servings in one sitting!) LOL. Beasted. Great verb, Allie. But yeah the fruit punch is ok. It does taste about exactly how you are imagining in your head right now. It mixes up bright red, and tastes like Hawaiian Punch. It’s really quite tasty. Green Apple: My least favorite flavor of EVL ENGN was the green apple. I must say that I came into this flavor with high expectations because my bff told me that this one was the best. And by BFF I mean the guy who works at GNC. LOL. (Like he’s not YOUR best friend, too?). I don’t know why I thought I would enjoy this flavor more than the others. I mean I don’t really like apples, much less the taste of an artificial tasting green jolly rancher. This flavor does taste alot like the Jolly Rancher, which is probably why I didn’t enjoy it very much. If you are going to get a tub of ENGN, go with the blue raspberry. Ok. Taste is done. How does EVL ENGN perform in the gym? I took EVL before a really strenuous weight training session because I knew it had all the creatine in the world in it- and I figured if I was going to get all pumped up I might as well do it big. And do it big we did. My friend and I dove headlong into 500 crunches, followed by about an hours’ worth of zig-zag squats. Zig Zag squats are where you do a set of back squats followed immediately by a set of front squats. (The training partner must pull off some weight between the two, of course!). I felt ENGN start to kick in almost immediately as we got after the crunches. This pre workout definitely does not alleviate the feeling of your stomach being on fire during your tenth set of crunches, I can tell you that much! Betaine: Improves strength. This is a very trendy ingredient these days. Choline Bitartrate: Enhances cognition and focus. I think I felt the effects of this ingredient for sure. L-Tyrosine: Another nootropic support amino that helps focus. Creatine Monohydrate: The most basic form of creatine to help boost strength and endurance. Magnesium Creatine Chelate (Creatine Magnapower): Probably my favorite form of creatine. This patented form give tremendous strength gains instantly without the need to load up on it for days before. Alpha-glycerolphosphorylcholine: I’m not even going to try to type that correctly. And no I don’t know what it does either. Caffeine: Of course the world famous ‘engine’ of the ENGN is caffeine. Agmatine Sulfate (Agmass): This is a pump ingredient in some fancy branded format. Beta-Alanine: Oh yeah, there’s beta-alanine in here. And a decent amount at that. Overall this formula is very strong. Like I said, it’s impressive that they were able to give such a ‘kick’ from such a relatively small amount of ingredients. I didn’t give them an ‘A’ on the formula because yes it is proprietary, and also just because it is such a small blend my concern is that they may have skimped on some of the more expensive ingredients. Let’s move into package analysis, shall we? LOL. Get ittt. Wow it must be getting late. 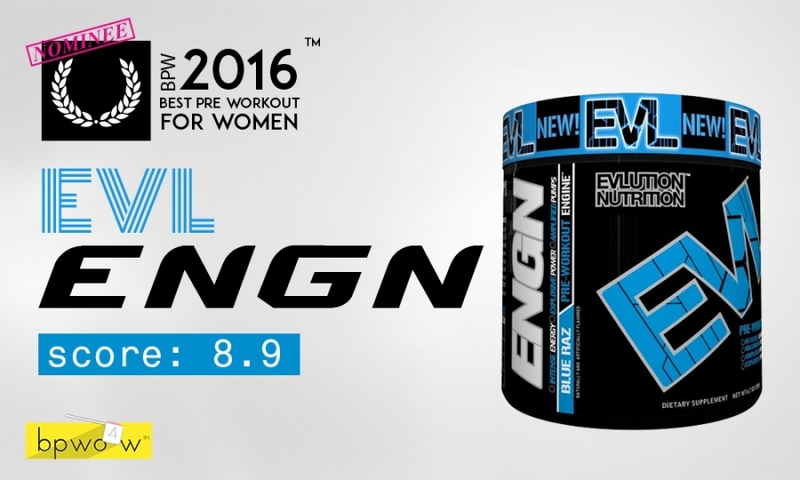 I AM giving EVL an ‘A’ on packaging because they have done something super super cool with the label on their ENGN pre workout. What they’ve done is that crazy image shifting/bending thing where depending on whether it’s tilted up or down, the colors change. It’s not pure holographic foil, but rather the kind where the thing REALLY changes because of that ridged plastic cover. I wish I knew for this effect because it is super hard to explain. But anyways. I like it because it’s the first time I’ve ever seen something like this on a pre workout. And as you know, originality goes a long way in my book when it comes to packaging and design. Nicely done, EVL! Other things that I like on this package are the colors themselves (blue, black, and green are striking together). The layout, while not the most logical, is effective and matches the edginess of the design as a whole. You get the sense of effectiveness, seriousness, and aggression from looking at this pre workout from EVL. I like it.